We recently spent a week sailing in the Caribbean aboard one of MSC Cruises’ newest ships, MSC Seaside. There’s so much to do on board this massive ship, planning out our days on board was a bit overwhelming. By the end of the cruise, though, we had our sea days down to a science. Morning: Enjoy a chocolate drink from Venchi. The coffee-based drinks, hot chocolates, and chocolate cocktails from Venchi are out-of-this-world delicious. The thick Italian chocolate doesn’t taste anything like the chocolate beverages we’re generally used to at home. It’s rich and smooth and keeps you coming back for more...probably every day. 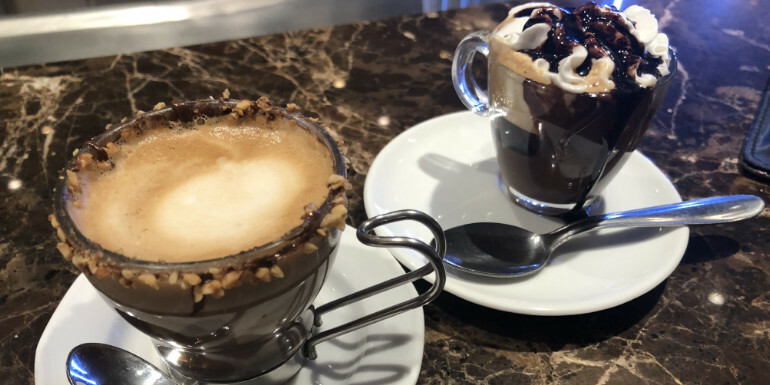 To start your morning off with a kick, we recommend the Marocchino (espresso with cream between two layers of Venchi chocolate) or the Suprema Experience (espresso with melted chocolate and whipped cream). We also tried the chocolate martini, and it sits among the top cocktails we’ve ever had. If you’re a chocolate fanatic, don’t be surprised if you somehow end up at Venchi more times than you were planning during your cruise. Late Morning: Laze around the South Beach area. The South Beach Pool, South Beach Bar, and a second Venchi location are all located on deck 7 aft on MSC Seaside. The deck is filled with tables and loungers around the large-for-its-location pool during the day, and in the evening loungers are cleared away for nighttime activities or dance parties. The bar is open 19 hours per day, too, so drinks are available during all waking hours. Venchi on this deck specializes in cups of gelato, gelato shakes, and crepes. It’s only open from lunchtime until mid-evening, but it’s the perfect spot to get a treat without trekking to the big Venchi inside or one of the buffets. Lunch: Grab a piece of pizza from the buffet. 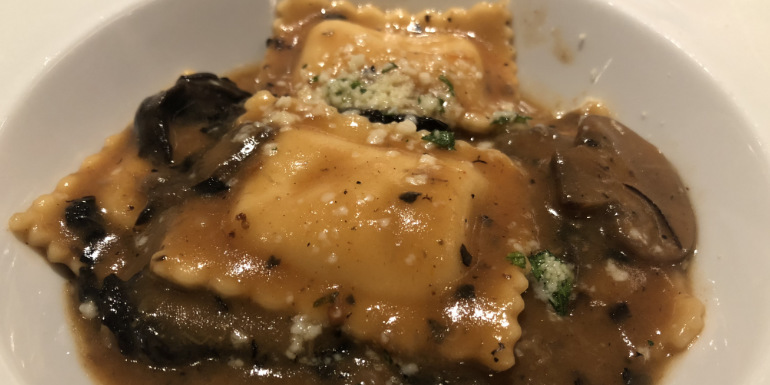 If you’re sailing on an Italian-founded cruise line, you’re expecting some of the best Italian cuisine at sea, and MSC Seaside does not disappoint. From the first piece of pizza we had in the buffet to the gnocchi and lasagna at dinner, these delicious dishes left nothing more to be desired. Often, cruise ship pizza isn’t anything to be excited about. However, here it’s perfectly baked and there are different varieties to choose from, like margherita, pepperoni, cheese, and a white garlic pizza. 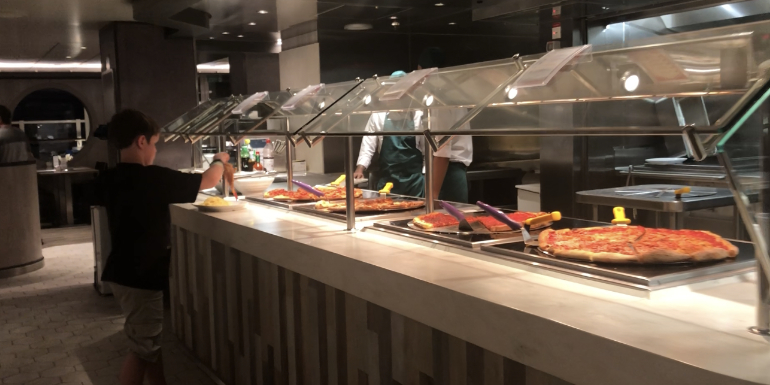 Both buffets also feature a fully-equipped pasta section, and you can usually find classic mac and cheese in the family food station (that’s not just for kids!). Tip: Don’t skip over the pizza section of the buffet during breakfast, they actually serve breakfast pizzas there! You might find an egg-topped pizza or dessert-style fruit crumble slices. 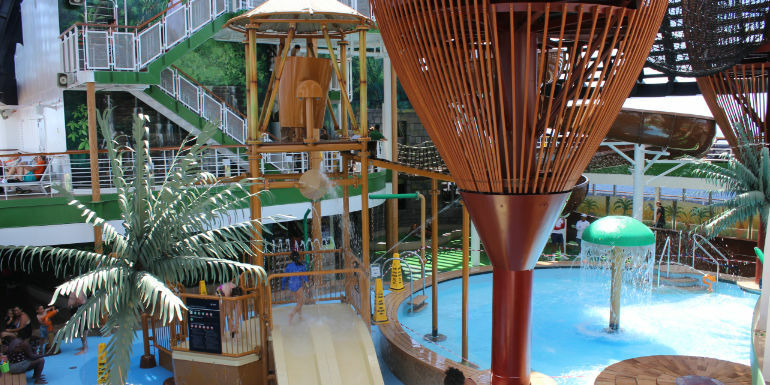 Afternoon: Hit up the waterslides in Forest Aquaventure Park. Seaside’s sizable water park area encompasses four waterslides, a kid’s wading pool, sprayers, a tipping bucket, rope bridges, and more. The jungle theme with artificial vines and trees works perfectly and creates a lush atmosphere for kids, parents, and the young at heart. Our favorite part of the park is the large tube slide, which is mostly pitch-black inside and includes a thrilling drop at the end. Towards the middle of the ship in this same area is the Jungle Pool, a good alternative for families who may not want to fight for space on the main pool deck. Adjacent is the Jungle Bar, blending into the area theming seamlessly. Dinner: Settle into the dining room for a pasta dinner. Our favorite things in the main dining room? Soups, pasta, perfectly-cooked meats, and decadent desserts. With the exception of the elegant night menus, there’s a section on the menu that never changes. If none of the rotation options appeal to you that night, you can look at that section for trusty “always available” favorites. But we encourage you to order off of the rotating menu if something sounds good - you probably won’t see those dishes again during the voyage. Pasta is made from scratch on the ship; you won’t find bags of spaghetti in the pantry rooms! Its freshness gives it a unique texture and every bite is full of flavor. To be honest, we never had a pasta dish we didn’t like on the ship. Evening: Catch the evening show in the theater. As wonderful as everything else on this list is (especially the chocolate and pasta! ), this may be our favorite thing about MSC Seaside. The evening shows are full-on productions, packed with the most amazing talent we’ve ever seen at sea. 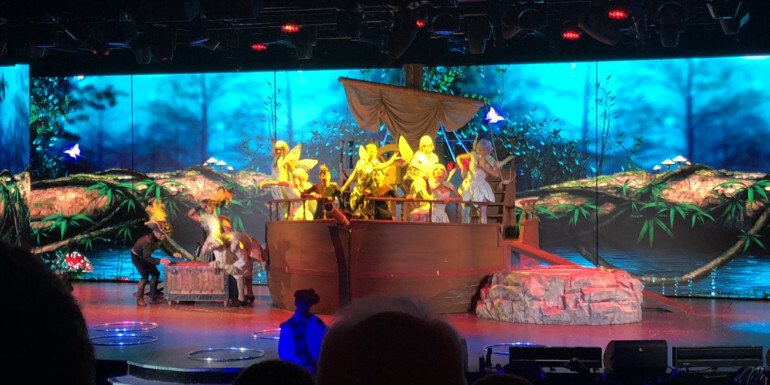 Each show has a loose storyline, like Peter Pan with a focus on the pirates or a time-traveling clock that has broken. However, none of the shows rely heavily on dialogue because there are so many languages represented among the passengers on MSC. Instead, the performances combine song and dance with aerial acrobatics, contortionists, magicians, gymnasts, and more to create colorful spectacles that awe the crowd every single night. There are multiple seatings each night so that no matter your dinner time, you’ll be able to catch the show and the theater is pretty full every time. We can’t speak highly enough of the evening productions, and recommend you go to as many as possible during your voyage — they’re different each night! Night: Find the late-night dance party. Every night on the cruise, there is music late at night somewhere around the ship. You can find a DJ spinning tracks in the atrium, a bar or lounge, or (our personal favorites) by the South Beach area or main pool deck. One unique night of the cruise that deserves a mention is the Silent Disco. Everyone dons headphones where you can choose between one of three music stations that the DJ is playing. The music isn’t playing out loud, but everyone is dancing (and sometimes singing!) to their own beat...literally. The result is a bit chaotic, but in the most entertaining way possible. 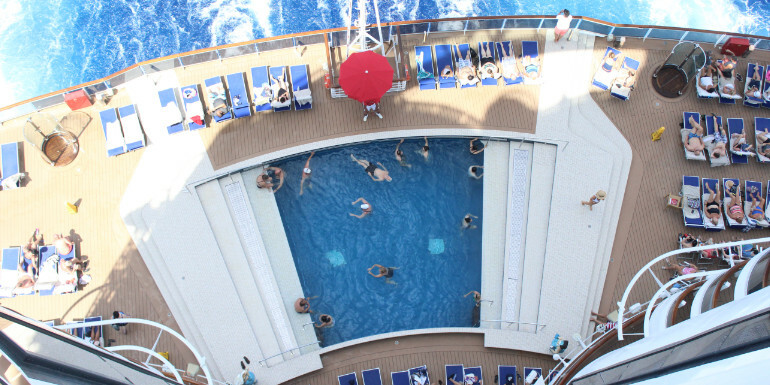 If the music is on the main pool deck, you know the party’s going to be big. 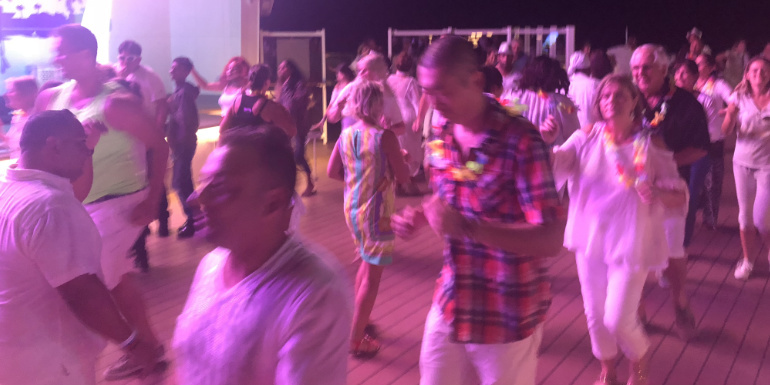 Our favorite themed evening is White Night, where the majority of travelers across the ship dress in their best white attire and gather on the top deck. The dancers show everyone the moves for each song, and it’s one of the most high-energy parties we’ve experienced on a cruise. 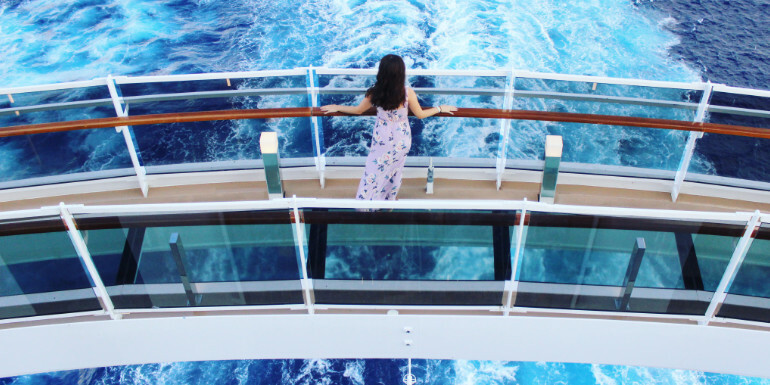 Are you planning to sail on MSC Seaside?